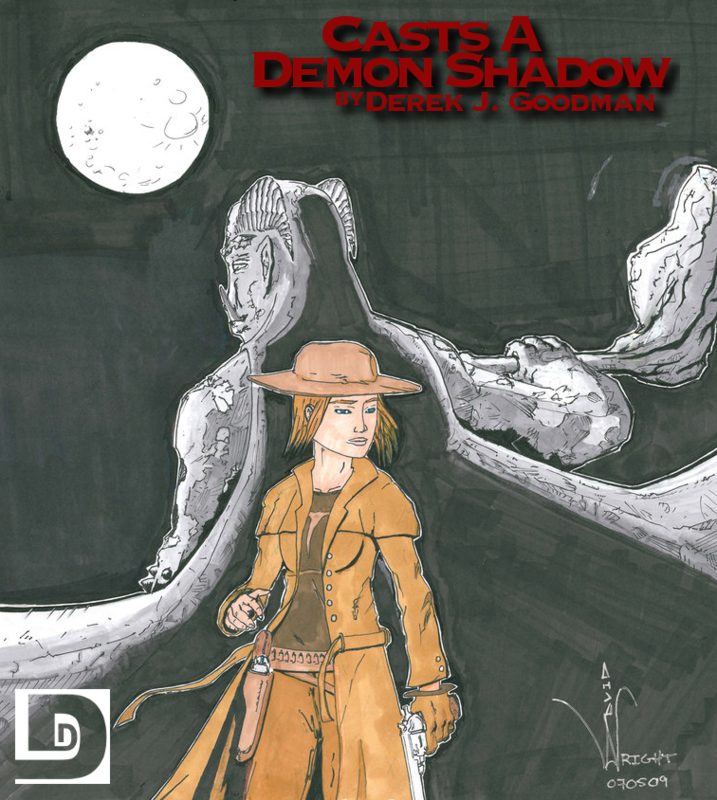 This entry was posted on December 17, 2009 at 3:11 am and is filed under Action, Adventure, Derek J. Goodman, Drama, Novelette, Western. You can follow any responses to this entry through the RSS 2.0 feed. You can skip to the end and leave a response. Pinging is currently not allowed. Sure, I’ll add it to the links on the post too. What an entertaining story! I really liked it. Great setting, and I hope to see more of Cassie. As for the length, I really didn’t notice, because I was so into the story. I’m all for keeping these as one issue, as opposed to serializing them. No particular reason other than I’m impatient and don’t like waiting for a story to continue. Abigail Hilton’s promo for The Cowry Catchers is wonderful, really sophisticated. She sounds like she’s done full cast novels all her life. Were you guys in it? Because if so I missed you. Sorry. We weren’t in the promo, but we did do parts in the book itself. This podcast is offensive to gay people! Even so, good work, guys and gals. Also, ditto to everyone who loved this story. It was great! Great music too. I thought the theme at the end was particularly good. And I made a note to remark on the sound effects. At about 36 minutes, there’s this sound effect that starts and I had to remove my headphones to check that the sound wasn’t coming from behind me. That was cool. Oh, and last but not least, the actor who played Cassie was EXCELLENT! She really brought the character to life. Great job! Great narration by Big. Good story. Lots of fun. I would vote not to break the long stories up unless there’s a very natural split. I’m gonna be in the minority here and say I’d vote for a split on stories 10K and up. As a podcaster, I feel that if you’ve worked that hard, you deserve to have 2 episodes in the can, not 1. If you ask your listeners whether they’d rather you release 1 episode per week or 2, of course they’ll say 2. We like listening to you! Ask us if we’d prefer you release 3 episodes per week; we’ll say yes! What you’re really asking is whether we think you should do the equivalent of a double-header periodically, and that’s more about your workload than what we think. Also, while long episodes are not a deterrent to your established listeners, they can be a turn-off to new listeners. At the very lease, put shorter stories in between longer ones, so that someone looking to sample the podcast isn’t too daunted. Oh, and Julie Hoverson rocked! Really nice job, Julie! arg. Well, yes, what Abbie says does make sense. That’s true. Twice as long probably does often equal twice as much work. It probably took another podcaster/author to recognize that point. Oh well. Anyway, that was really enjoyable. Abbie is completely and inarguably right. The length was fine, I have no problems with longer episodes. I really liked this story, it’s a great genre and made me fondly remember the role-playing game Deadlands I used to play in college. It’s got almost everything that the story talked about, in some fashion. Seems to be out of print now, but I think one can find copies if they look hard enough. Great job on Cowrey Catchers so far guys! I picked up copies of some Deadlands books when David and I were doing research for our comic book. I wanted to see how much our ideas had in common with the game. There are some things that they have in common, but I was confident that there was enough of a difference. Thanks to everyone who liked the story and would like to see more, but I don’t know how likely that would be. I would need to get David’s permission for any new story. We recently acquired the rights to publish a VERY long story (so long, it took me a month to get off my arse and read it), by an author most of you would recognize, but we’re worried about how to do the episode. Like we said, if we split it in two, do people need a “previously on…” or do we just continue where we left off? Also, do we do a post-story discussion on both parts, or just the second one? Also, Dr. Goodman, has your buddy David listened to the show? What did he think of your story? Maybe you two could collaborate on writing a sequel. Unless, that is, your experience with collaborations is as disastrous as the one Big and I will present to you in a just a few days. Rish – I’d do a previously-on (just because people seem to like them) and story discussion like normal for each episode, but avoid spoilers for upcoming content. Reasoning: I got a lot of requests for story-so-far’s when I didn’t do them in Prophet. The requests were always from male listeners. Guys seem to have a harder time keeping track of things. The girls didn’t seem to care whether I did them or not. *shrug* (As soon as I say that, a dozen girls will pop up and say that they cannot listen to a book without SSF, and a dozen guys will announce angrily that they hate the things, but that’s just what I got from my listeners for Prophet.) One tries to avoid confusing half the audience, ya know? I think the chatter should stay because it’s one of the reasons people listen to your show, and it adds continuity from episode to episode. Rish – Okaaaay, you had a specific story in mind when you asked about splitting a story into two parts. That’s different. Since you have a VERY long story, then two parts makes good sense. The second part will not *need* a “previously on…” segment, but if you do one, I promise to enjoy it. Most of the time I refresh my memory by listening to the last couple of minutes of the last episode, but when that podcast is The Dunesteef, the end of the story in the last episode will be difficult to find. Besides, doing new things is a good way to stretch yourselves as artists. And it will only take a couple of minutes. Right? I agree. I would be sad if a show lacked the banter. I’m not sure you need a “previously on” section if there are only two parts, but since you do a quick chatter before starting each story, you could just remind people where it left off in that segment (and tell people to listen to the other one first if they’re listening to back episodes). First off, great episode. It does remind me of an offshoot story of the Dark Tower series. And Julie, you sound uncannily like Kimberly the Merciless. As for longer episodes, I think I would prefer it all in one, although SSS is currently doing one in three parts, and it is utterly exhausting. Keeping up with the Victorian flavor of it is making it unfun. But keep in mind, some people have mp3 players that cannot stop and start episodes midway and have to finagle the danged contraption to get it to start midway. So, selfishly, 1 episode. For the sake of others, in more than one part. Glad I could help. I will leave now. STORY: Honestly, for some reason I really didn’t like this story. Stonehammer’s first appearance felt like a deus ex machina, and the story itself sounded like something I’d read before — not because it was copied or anything, but because I’ve heard similar stories in a non-old-west environment similar to what R&B were talking about after the show, westerns being remade as sci-fi or Japanese films being remade as westerns. It might have been because the story was so long; I too write long stories, and sometimes they need to be shorter. I just kept waiting for myself to care about what happened, and I never did. PERFORMANCE: Pretty good. However, the western accent of the narrator got a little tiring to listen to. When listening to someone speak with an accent that isn’t your own, sometimes it can get tiring to continually “adjust” the voice in your head. COMMENTARY: I would rather see the stories as single episodes even if it takes longer to get them out. However, if you do end up splitting them, do “previously on”. And don’t change the structure/makeup of the show for longer stories; just do a longer show. Overall, not my favorite episode of the show. But as I’ve said before on other podcast comment threads, they can’t all be winners. are you guys sure you don’t need a forum? We might. Kevin, you know someone who is experienced in running forums, don’t you? I’m having a ball working over here with the guys, too!!! I make a point of downloading the longest ones first; I feel betrayed and vaguely irritated by even the 59 minute ones. Then I think to myself “There’s no way those are their real names – wth are they hiding?” and then I realize, “omg; this is just the Stuff You Should Know guys pretending to be someone else!” and then I call the cops, who threaten me for wasting their time, which proves that you’re all in it together and I’m getting screwed. If you don’t make the episodes longer – WAY longer, I will do something rash and regrettable.